I have a craving. A burning desire, a yearning. It can defy logic and reason. I know I’m not alone. I’ve got it. It’s almost a physical ache. Call 911. The other day I was Googling around and ran across a way cool, new Eastman El Rey 0 at Bernunzio Uptown Music shop in Rochester, NY. My first thought: wow. My second thought: odd. Odd because Eastman stopped making this model in 2010. I Googled some more and saw another at Sound Pure. It has all the G.A.S. producing qualities. 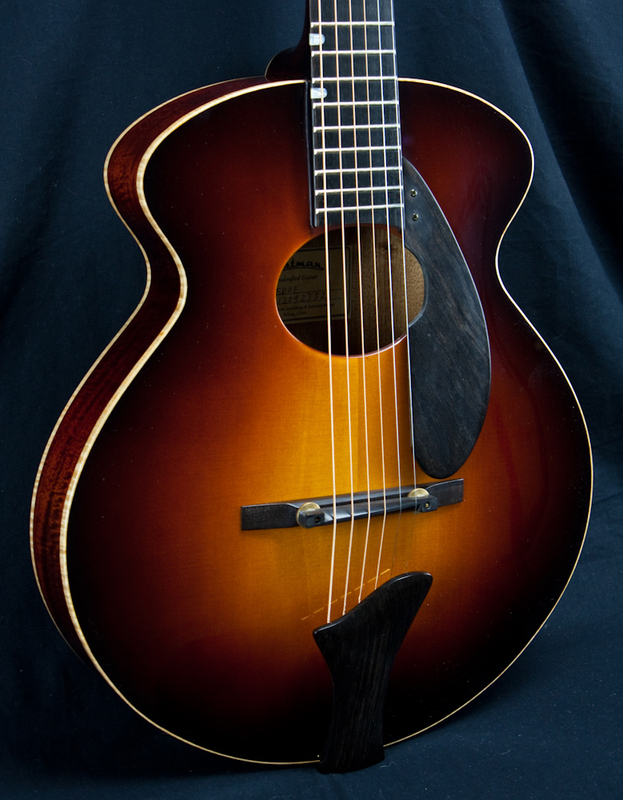 At 14 1/2″ it’s a small, modern looking acoustic archtop with an oval sound hole, designed by luthier Otto D’Ambrosio. The top is hand-carved spruce and the arched back is hand-carved mahogany. It has maple binding and a gorgeous sunburst finish. Curiously, the neck joins the body at the 16th fret. I’ve been intrigued by this model since the first time I saw one. 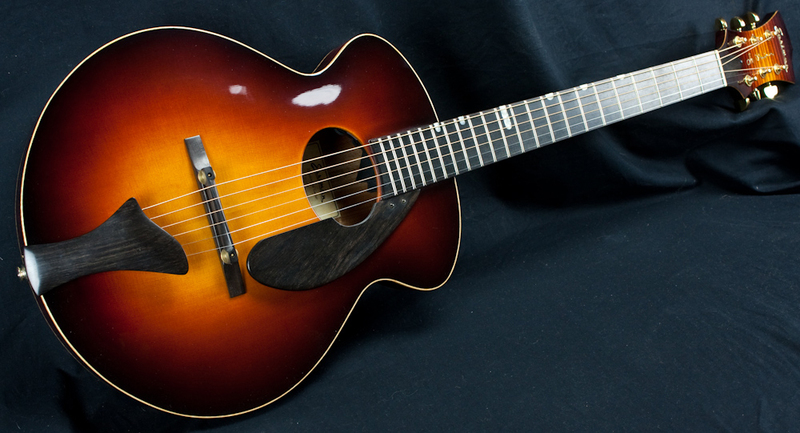 It just looked cool — sort of old-fashioned like an old Orville Gibson body but with an updated — very modern — shape. Every so often one will turn up on E-Bay, usually with a ding or a scratch. I even asked a local Eastman dealer to see if he could unearth one for me a few months back. I imagined him calling sterile climate controlled warehouses and dark underground storage vaults. Or at least calling a guy who knows a guy. 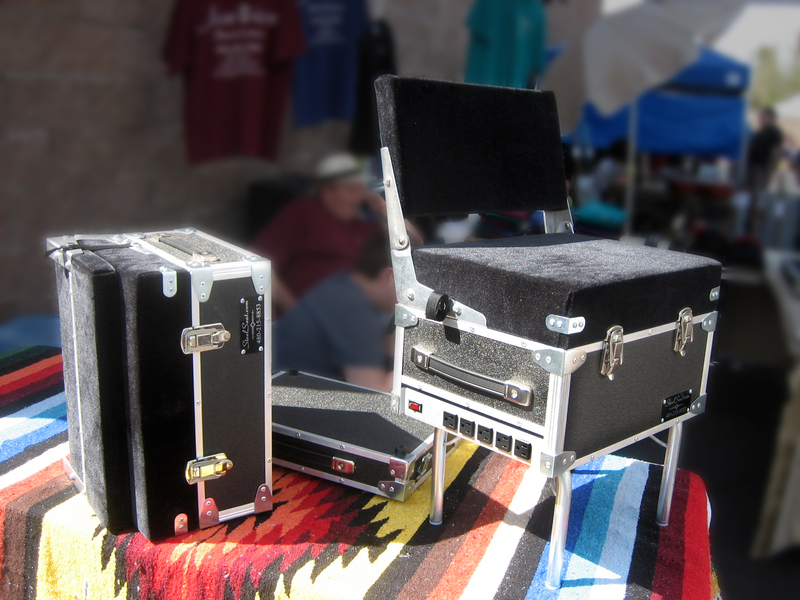 But even though his extensive resources couldn’t shine a light on one of these unique beauties, it turns out there are still a few NOS ER0s out there for some lucky jazz players. And just like the magic bus — I. Want. One. 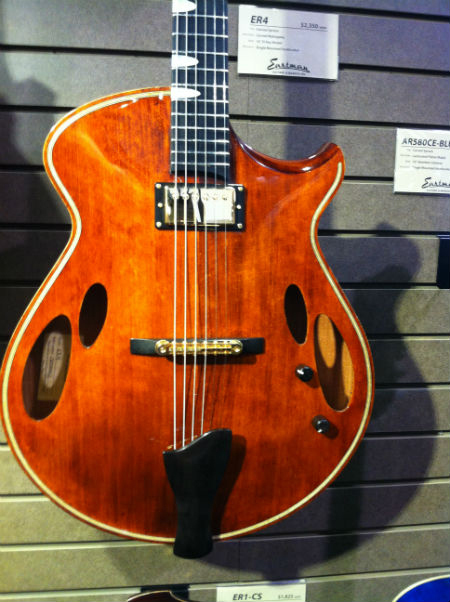 By now, anyone interested in affordable archtops knows the Eastman Music Company story … a Chinese violin manufacturer turned guitar factory — crafting well made, modestly priced, solid wood, hand-carved archtops to rave reviews. 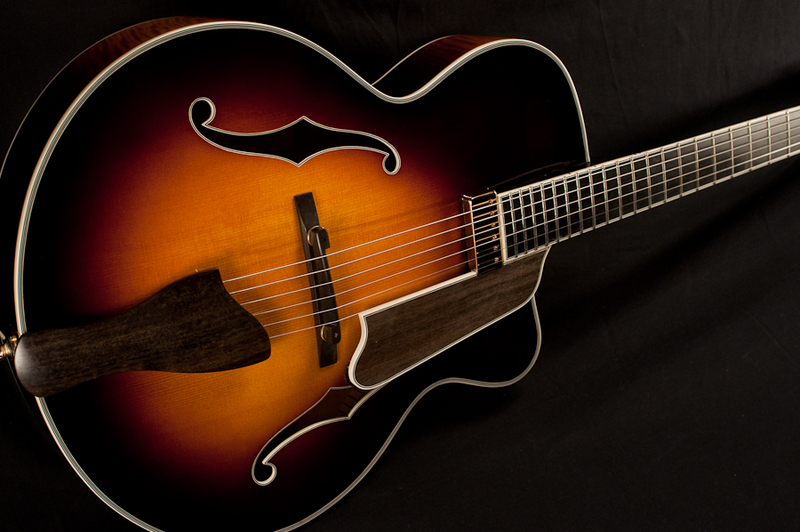 Their flat-top guitars are usually described as the best, great-sounding value you can find and their mandolins are famously regarded as well. Eastman guitars usually come with a really sharp-looking, colorful fiberglass case (cases can be purchased separately, too). By the way, Eastman still makes and sells violins and other woodwind and brass band instruments too. About a year ago I bought an Eastman AR805 CE on E-Bay for a really good price and I’ve been a fan ever since. I think I’ll go practice with it now and see if that doesn’t give me some G.A.S. relief. There was an interesting collection of local, regional and national vendors. I was surprised how many companies were from out-of-town — a Bigsby rep from Minnesota, Republic Guitars from Texas, Flagg Audio from San Francisco and more. Gretsch Guitars sponsored the Twang-O-Rama Concert Stage that featured Stray Cat’s bassist Lee Rocker. Bigsby was offering free installation of their guitar vibratos on-the-spot. There was a pleasant cacophony of guitar, amp and microphone demos. There were luthiers and a luthier school, recording studios plus a bunch of amp builders. Gretsch! In all the springtime colors. Thank you Gretsch for sponsoring the stage! 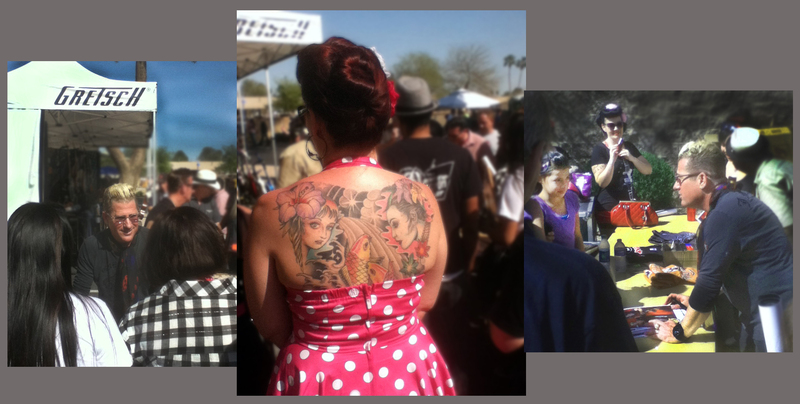 and finally, Stray Cat Lee Rocker was there signing autographs … darn, I missed his show! It was an enjoyable show with a good variety of products to browse … well worth the cost of admission … FREE! A nice excuse to get out and bask in the southwestern spring weather. I’m already looking forward to next year’s show … I’d love to see this event continue to grow.